Our website www.classandjazz.be does not collect any data. No cookies or trackers. Class & Jazz does not use any social network. Our students / clients / teachers implicitly give us permission to use and process their data, as these data are transmitted to us through a data sheet filled out by themselves. Our students / clients / teachers, and their parents / family, can view, check, update, correct or delete this data at any time * by contacting the DPO, Raphaël Van Goubergen. *Our accounting data must be kept legally for 15 years to allow tax audits. Our teachers have all the data of their students and their parents, for communication, and for pedagogical reasons. Our students and their parents have contact information for their teacher (Gsm number and e-mail address) for the communication. Our teachers have the contact data of other teachers (Gsm number and e-mail address). Contact data and photo of our teachers are publicly available on our website. In the eventual need to send group e-mails to all concerned students and parents, Class & Jazz uses exceptionally the www.mailchimp.com platform where a list of e-mail addresses is stored on an account dedicated to Class & Jazz, accessible only by the DPO Raph Van Goubergen. These mailings always give the option to unsubscribe from the mailing list via an unsubscribe link. Students and parents can, if necessary, have e-mail addresses of other students and parents. See “small group collaborating” below in the table on our communication. 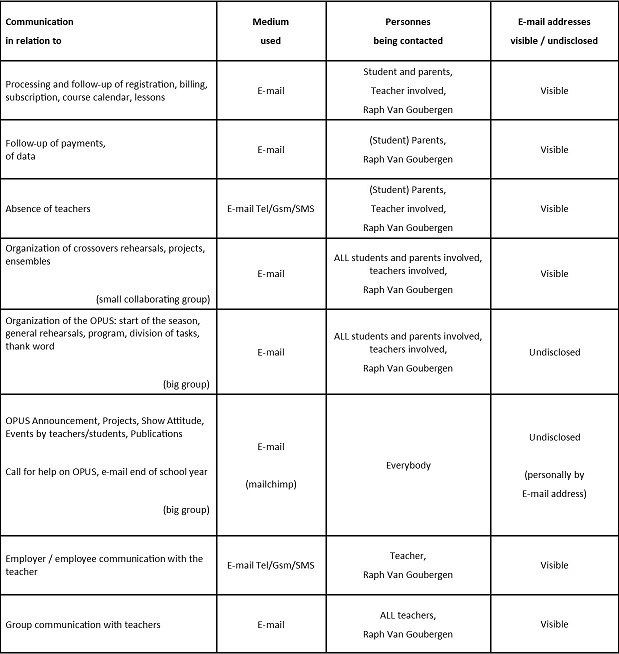 Below you will find a detailed table explaining how we communicate with our students / clients / parents / teachers. So, you know now … what you probably already knew, at least in outline. And, for those who have been courageous enough to read so far, Class & Jazz would also like to share the following. The GDPR law, in effect since May 25, 2018, which requires us to write such privacy statements, and requires you to read them, of course intends to protect your privacy. A goal we adhere to without hesitation. But in our opinion, the logic of this law misses its objective on (at least) two points. 1) By forcing small fish like baker, butcher, grocer, … and Class & Jazz to comply with this law. Because, let’s be honest, it would be very difficult for us to teach an anonymous “John Smith”, without address, without contact data, without age, and without contact information from his parents if the little “John” is still a minor age. The data we collect is in fact exactly the same as what we already collected in our past address books. And the processing and use of these data also serve exactly the same purposes as in the past: simply being able to work together. What’s new since the ’80s /’ 90s are the e-mail addresses that, in most cases, simply replace the post address. 2) By actually offering the big sharks like the GAFAs (Google, Apple, Facebook, Amazon) and thousands of other data collectors a free guide to continue fishing for your surfing and buying behaviour (and many other “facts”), so to speak “To be of better service”, but actually, and you know that, and I know that, out of pure profit. Because, let’s be honest, you and I will continue to click the “accept” button on the internet, if we want to continue to use their services. And none of us will have the courage or the patience to read all the “privacy statements” and other “terms and conditions”, which will imply us to accept anything and everything. Perhaps it was not so easy to make the difference, legally, between these small fish and these big sharks. The question remains: Have the lawmakers really tried? Are there no other possible laws to limit the appetite, if only a little bit, of these big sharks?